A few semesters back, I made a presentation on 1984 by George Orwell for my English class. I want to transform it into an interactive Deck, but I’m not sure where to start. Can you help me turn my static slides into active ones? You’re off to a great start, even if you don’t know it yet — you’re asking a question. The number one, most important, unforgettable, stitch-it-on-a-throw-pillow tip to remember is: ask, don’t tell. Let the Slide Doctor expand on this a little. The temptation as teachers is to give your students all the information, isn’t it? After all, you know the answers; you’ve got the study guide right there in your hand. But for an effective active learning experience, students need to examine their ideas and learn from each other, dear reader, not just from you. Chances are, you already know how to add interactivity to your Slides — just fire up the Pear Deck Add-on in Google Slides, and the tools are right there at your fingertips. All you have to do is click the question type you’d like to add to the current Slide. But physically adding the questions is learning the steps, but not the dance. Let’s take some of your Slides for a spin, flip them around, and let your students take the lead. 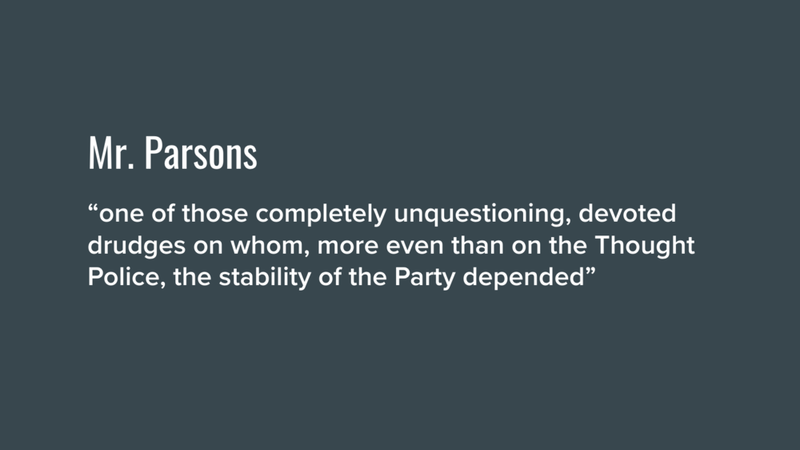 Here’s your Slide about Mr. Parsons from Chapter 2. Now, instead of just memorizing the information, ask yourself: what do I want my students to learn from this? Use this opportunity to pick out the point. The important thing is that they know what Mr. Parsons contributes to the Party, yes? So rather than telling your students what personal peculiarities Parsons presents to the Party, ask, and let them tell you. A Draggable Slide is a great type to use here, but Multiple Choice, Text, or even Drawing could all work — the Slide Doctor would never dream of being prescriptive. Just make sure you mix up your methods so you aren’t over-using one question type. 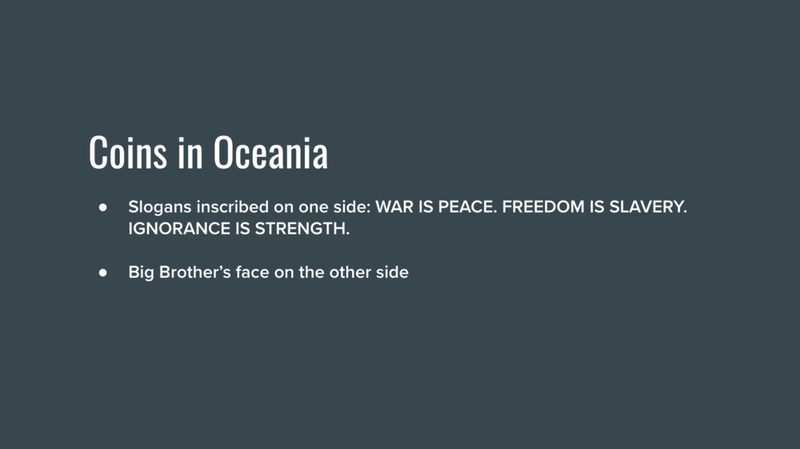 This Slide, about the coins used in Oceania, gives some solid insight into what the Party thinks is important. But, once again, let’s find out what the students know rather than what you do. Ah, the perfect place for a Drawing Slide! This gives students a chance to be creative and asks them to, ahem, draw on the knowledge they’ve retained from the reading. Don’t forget to use the Dashboard to showcase especially exemplary answers to the class. 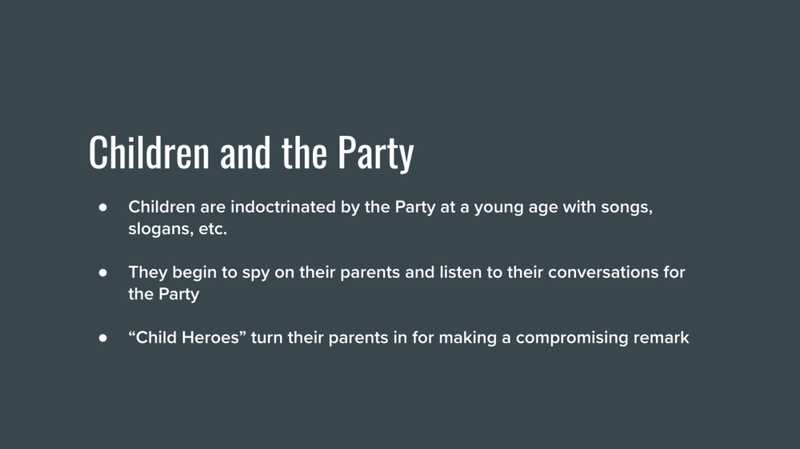 The pernicious propaganda of the Party is put forth on this Slide, but are all these bullet points necessary? Or is there a better way to get students discussing the concept, possibly even before they know the word propaganda? This is a job for the Multiple Choice slide, and it doesn’t have to be used in the traditional one-correct-answer way. 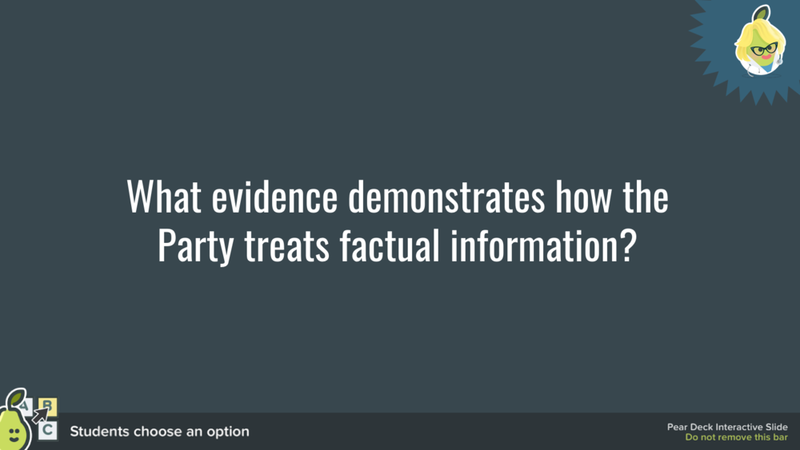 By offering multiple “correct” choices, students have an opportunity to discuss the different pieces of textual evidence, and describe for themselves how the Party treats facts. Once they’ve described what the Party is doing, this is an excellent time to introduce and discuss the word propaganda — filling in a word they need for a concept they understand, rather than asking them to memorize a word and its definition. Of course, sometimes a topic calls for more in-depth discussion than can be easily achieved through a Draggable or Multiple Choice Slide. This is a terrific time to toss in a Text Slide, so students can give a longer, more thoughtful response. In this case, the point you are driving home is that children are turned into tools of the Party from a young age. Rather than clutter the slide with lots of pieces of information, let’s try to narrow in on one that will help students see the whole picture. Understanding this one piece makes the picture become clear. Parents fear their children because their children turn them in; ergo, children have been made loyal to the Party over their own families. You’ve just asked students to summarize the salient point of Chapter 2, and you only had to ask one question. The Slide Doctor, as you may recall, adores efficiency. 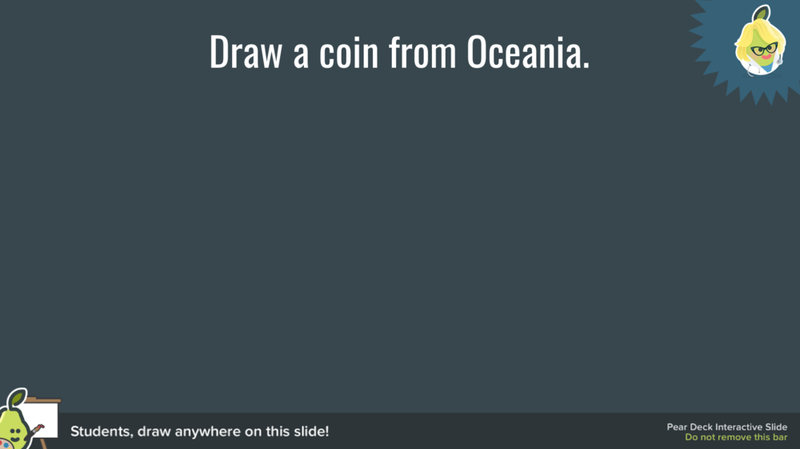 And don’t forget, you can always add a question on the fly as you’re presenting! With these tips in mind, Asking, you’ll be well on your way to an engaged and enthused class before you know it.